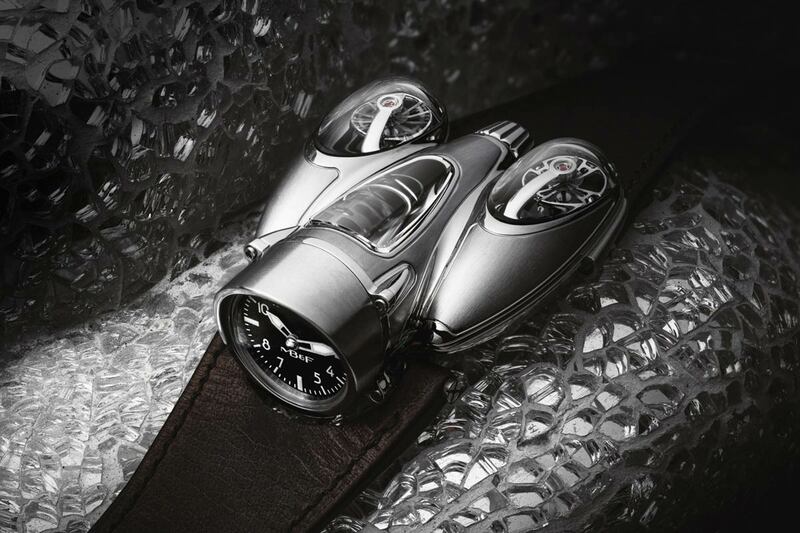 Independent watchmaker MB&F has just presented its new creation, the Horological Machine N°9 ‘Flow’ or, more simply the HM9, the latest of an exceptional series of timekeeping machines characterized by sculpted cases and beautifully-finished engines. 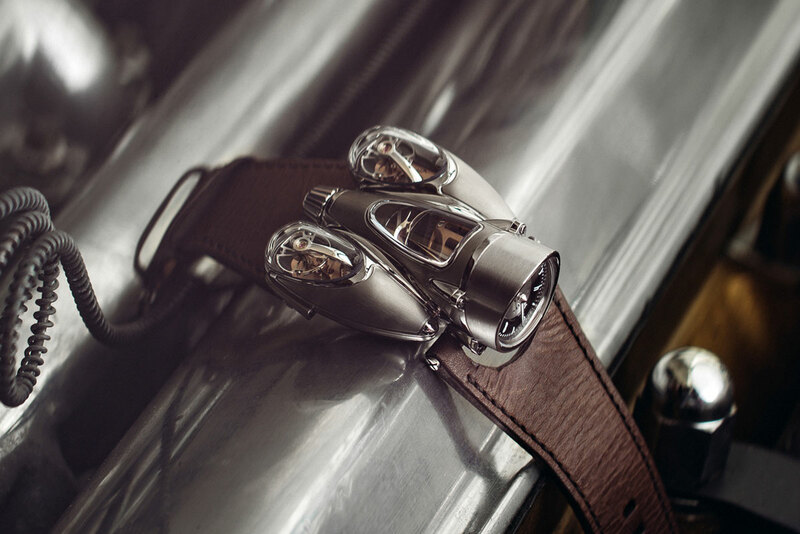 The HM9 takes inspiration from the dynamic profiles of automotive and aviation mid-century design and is somehow reminiscent of a jet engine. 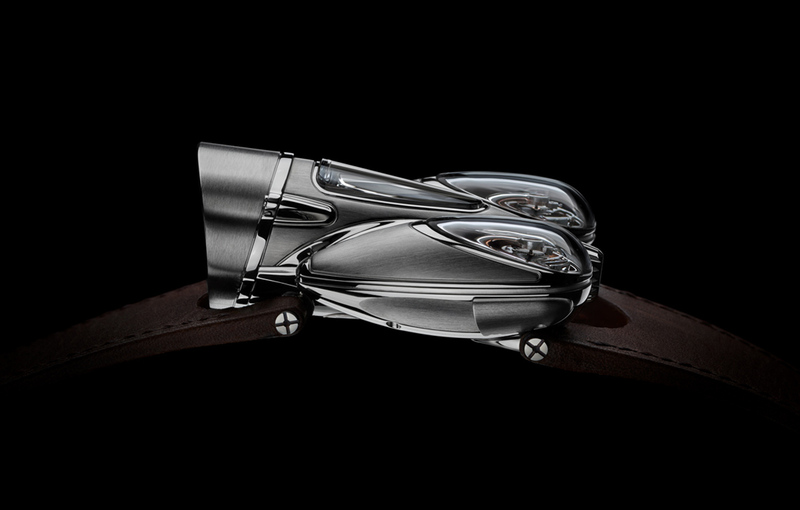 The complex titanium case, alternating polished and satin finishes, houses a hand-wound movement with two independent twin balance wheels slow beating at a frequency of 2.5 Hz (18,000 vibrations per hour) on each flank of Horological Machine N°9 and visible under elongated domes of sapphire crystal. 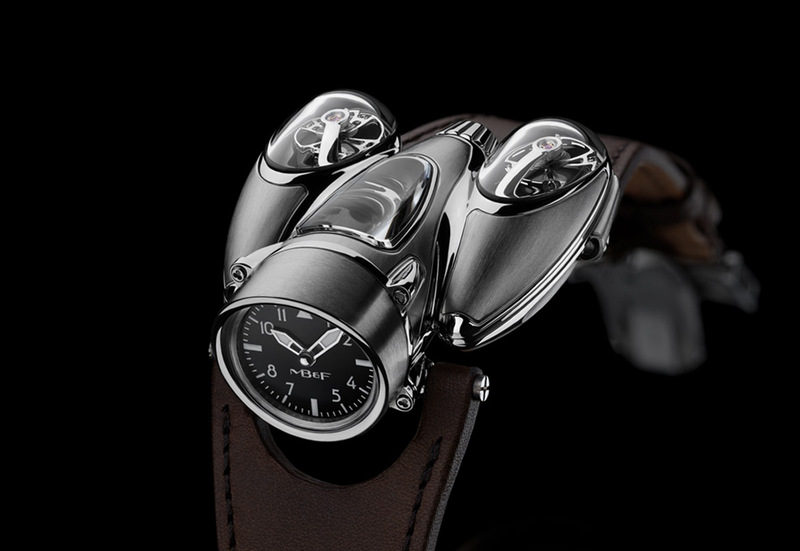 The output of the two balance wheels is averaged by a planetary differential that is also visible through a third pane of sapphire crystal on the central body. The result is a more stable display of the time. 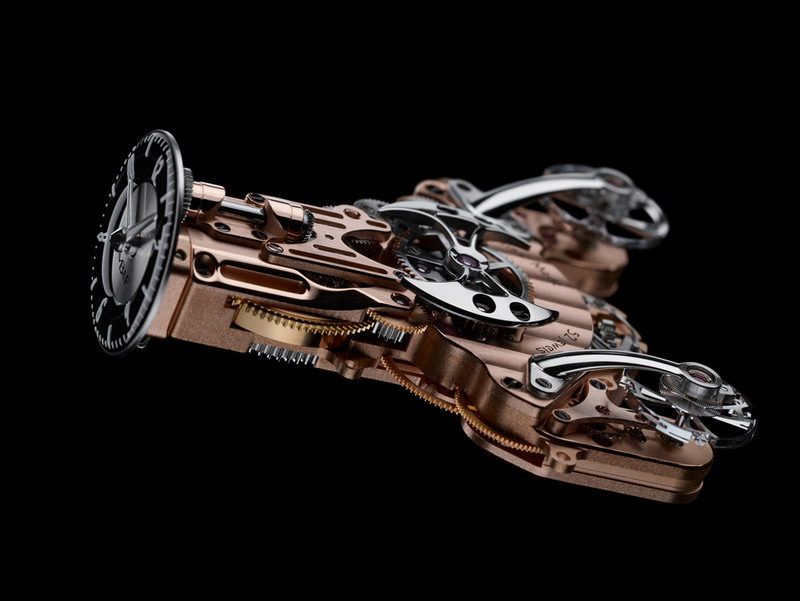 Featuring 301 components and 44 jewels, the movement delivers 45 hours of power reserve through a single barrel. 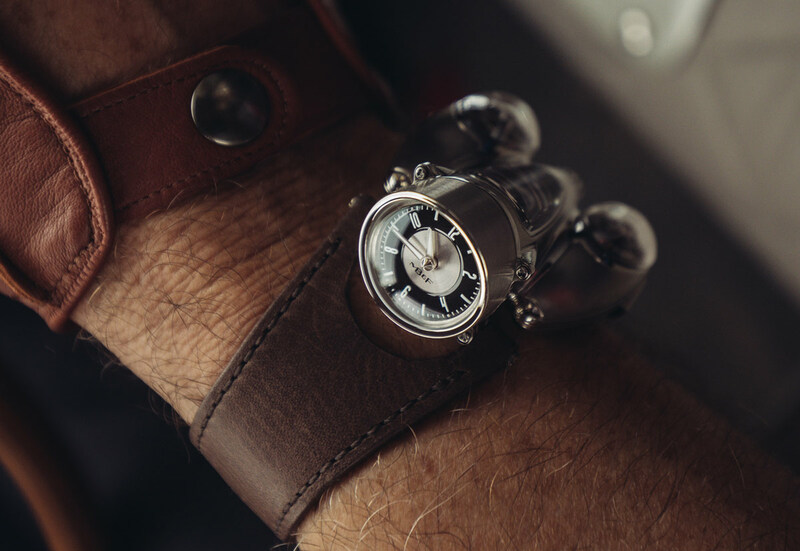 Perpendicular to the rest of the HM9 engine, the dial indicates hours and minutes, driven by conical gears that ensure precise engagement even when motion is put through a 90° planar translation. 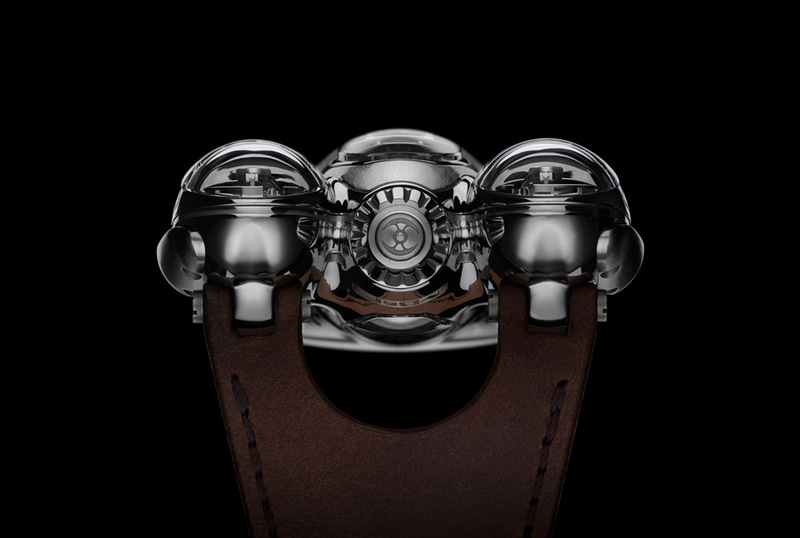 The fluted design of the winding and setting crown is perfectly coherent with the rest of the case. Located on the rear of the central body and easy to reach, it provides an ergonomic grip. 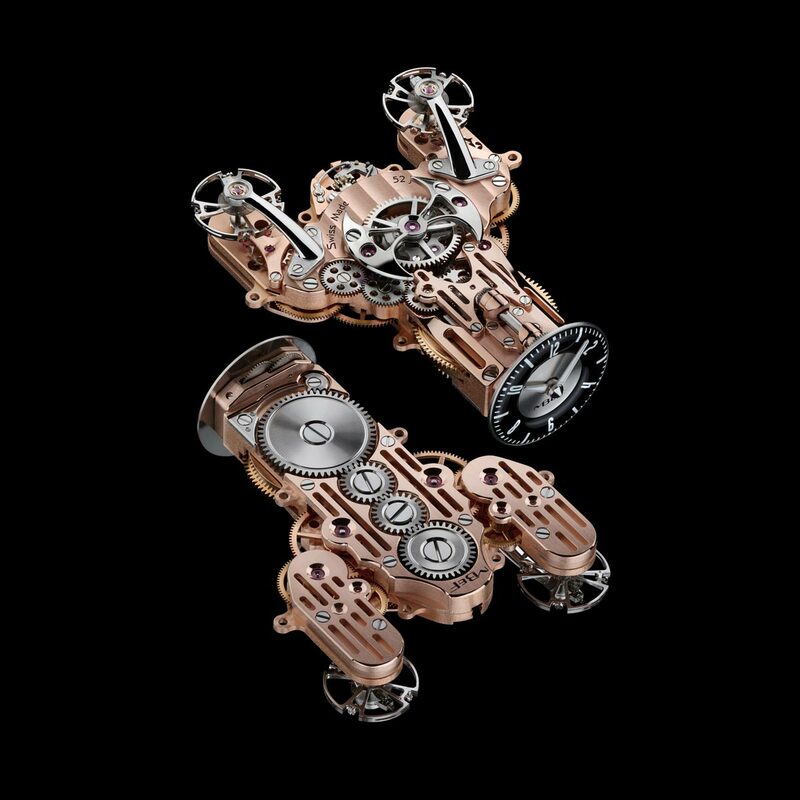 The Horological Machine N°9 ‘Flow’ is more compact than you would expect measuring 57 mm at its widest point. 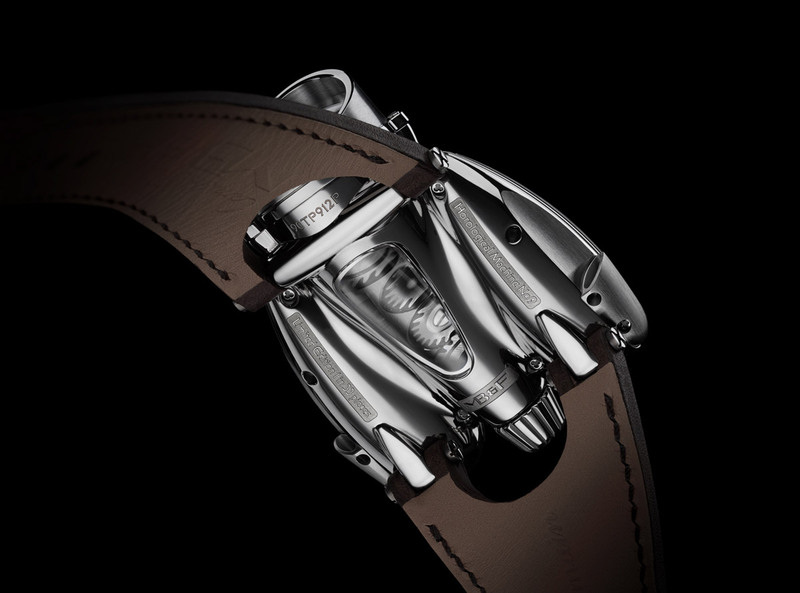 Crafted from grade-5 titanium, the case (57 mm × 47 mm × 23 mm) is water resistant to 30 metres / 100 feet. 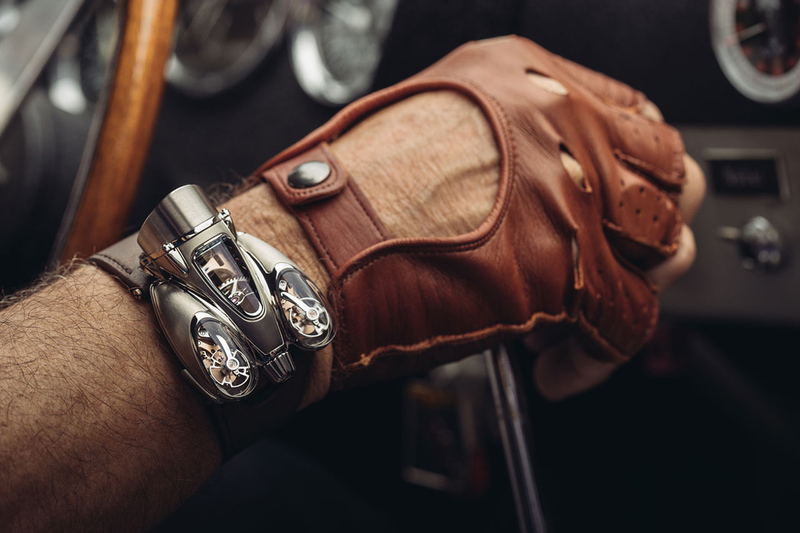 To guarantee this level of water resistance, it was necessary to devise an unprecedented – and patented – three-dimensional gasket. 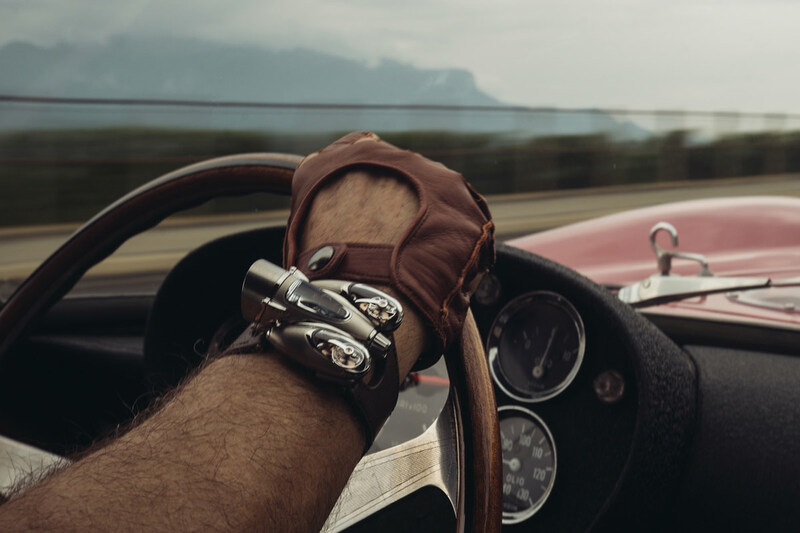 The Horological Machine N°9 ‘Flow’ debuts in two editions, each limited to 33 pieces: the ‘Air’ edition featuring a dark movement and aviator-style dial, and the ‘Road’ edition with a rose gold plated movement and a classic speedometer-style dial. 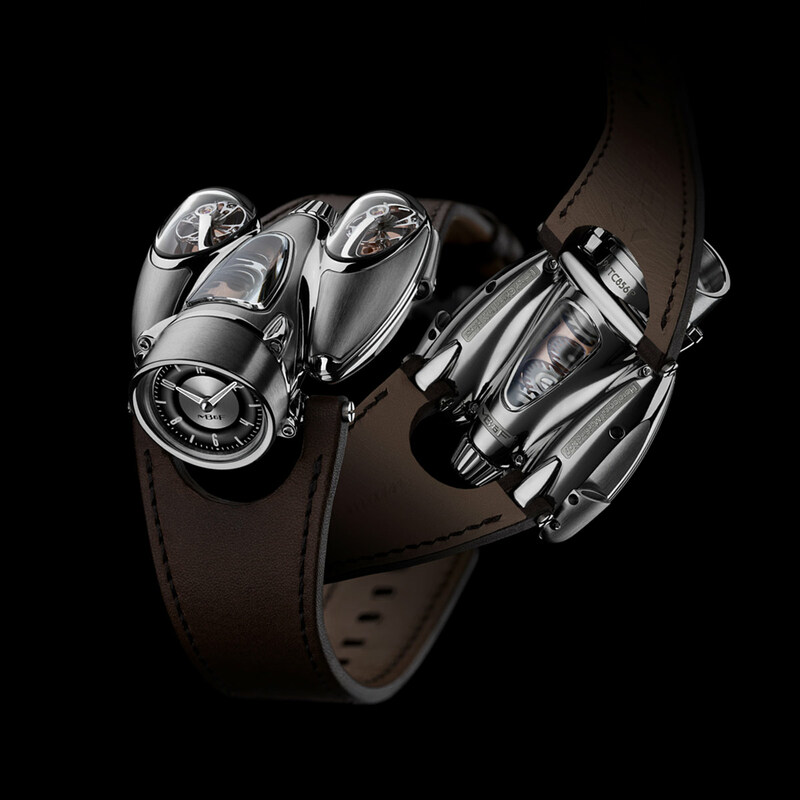 Completed by a hand-stitched brown calf-leather strap with custom-designed titanium folding buckle, the MB&F Horological Machine N°9 ‘Flow’ has a price of Swiss Francs of 168,000 plus local taxes. 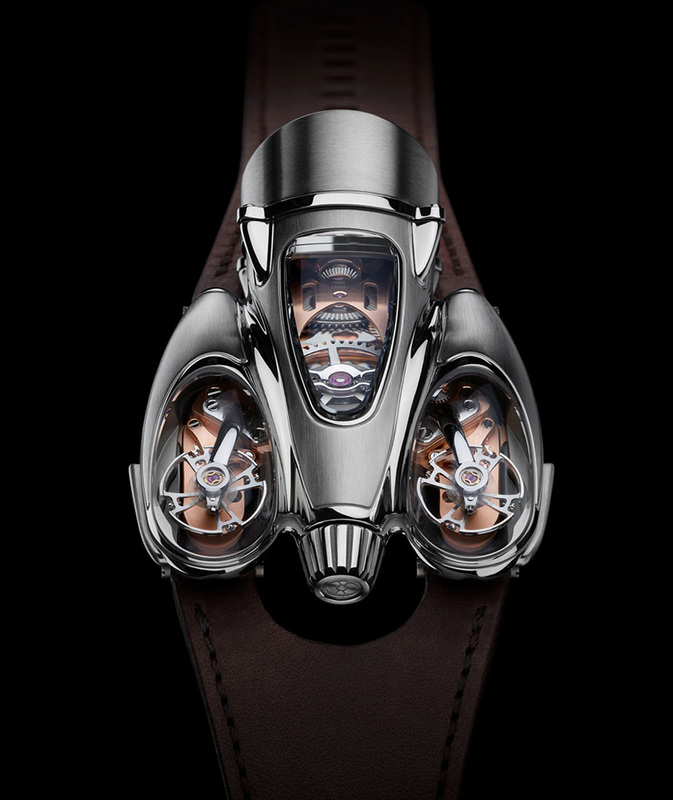 And don’t forget to check 25 luxury watch brands for men and 10 most expensive watches in the world.